Stellar weather and seasonal spirit combine to make December an incredible time of year to enjoy Orlando - especially outside. 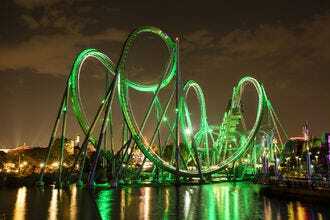 At the theme parks - Disney, Universal, SeaWorld and the like - the incredible attractions are bolstered by holiday-specific programming. 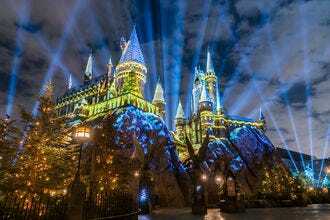 In 2018, Christmas in the Wizarding World of Harry Potter is still big news, where new music, sensational decor and a showstopping production on the face of Hogwarts Castle take center stage. 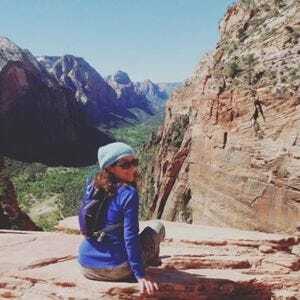 Outside the parks, however, the beautiful weather beckons those with an interest in outdoor exploration. For that, we recommend a visit to the Nature Conservancy's Disney Wilderness Preserve, an 11,000-acre wonderland that's a model of conservation. Walk it's 2.5-mile trail (sometimes you won't see another soul on your journey) and spy native flora and fauna, then learn more about it in the interpretive center. 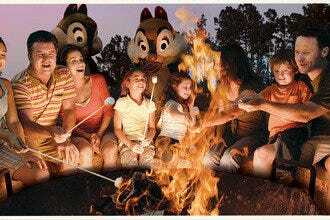 It's a side of Disney few know about, let alone visit. 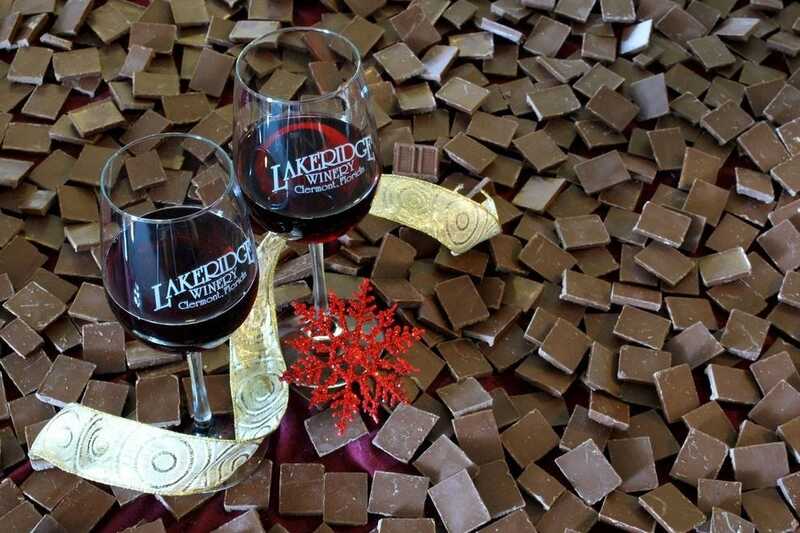 Out in Clermont, the rolling hills of the Lakeridge Winery beckon not only with sweet bottles, but sweets themselves! It's Wine & Chocolate Festival features more than just the top-billed treats, though. 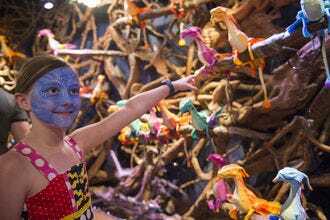 Live music, arts and crafts and more make it a very family-friendly good time. This East Orlando favorite (and holiday pseudo-homecoming for locally based alumni) runs from November 16 through December 31 and in 2018 is in its 11th year of bringing holiday fun to the community. On tap this year: snow, incredible choreographed lights and lots of rides. Showing up and hanging out is free, and music-synchronized holiday light shows run hourly. The twinkly bulbs cover the entire façade of CFE Stadium. It's fun and festive, but most people come for the fun winter activities! Ice skating ($12), an Ice Slide ($6.50 unlimited) and several great rides ($4.25 apiece). Friday and Saturday nights throughout its run, Light Up UCF features free outdoor movies, each with a holiday theme. Bring your own chair or blanket and a thermos of cocoa. This year's schedule includes Elf, Miracle on 34th Street, The Santa Clause, A Christmas Story and more. Photo-ops with Santa start at $15 and you can skip the crush at the mall. 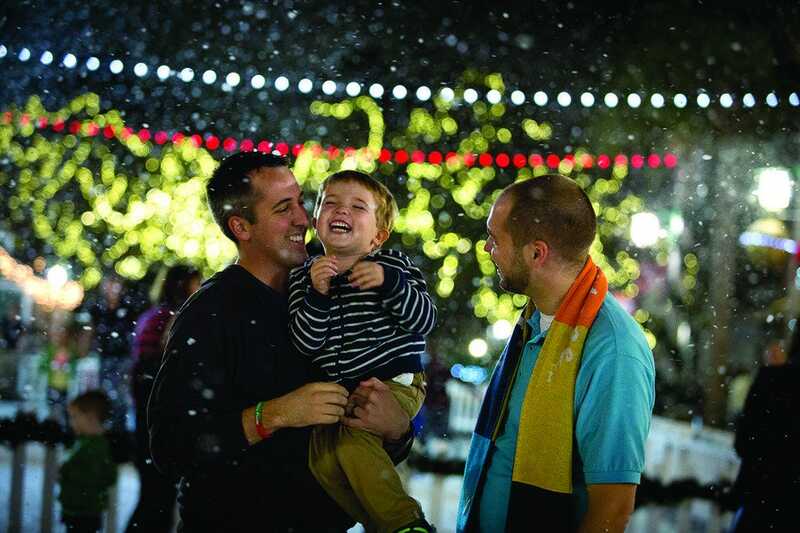 The quaint town of Celebration was essentially purpose-built for small-town charm and family fun and so it's no surprise that Now Snowing ranks among Central Florida's original and premier "snowing" events. Now Snowing offers a schedule filled with family-friendly holiday surprises and features an ice rink, Dickensian strolling carolers, community performers, photos with Santa, horse-drawn carriage rides, the Celebration Express train, and, perhaps most delightful to guests more accustomed to a subtropical Christmas: a nightly "snow" flurries at 6:00, 7:00, 8:00 and 9:00 p.m. Now Snowing runs November 24 through December 31. On select nights, now through Dec. 21, the Magic Kingdom becomes a holiday haven as the halls are decked to the Disney nines and Cinderella's Castle comes alive with icy-glittering lights. 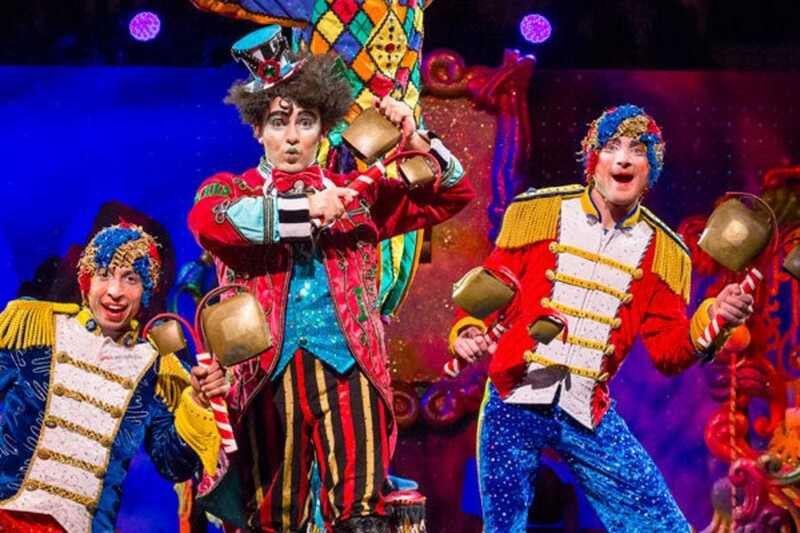 This separate, ticketed event (prices start at $99) features live entertainment, spectacular fireworks and a holly-jolly holiday parade that only Walt Disney World could put together. See Mickey, Minnie and all their pals, dressed in their seasonal finest and whistle along to holiday tunes; folks of all ages are enchanted by the Magic Kingdom and all its cast members, from princesses to characters to the delightful march of the toy soldiers. When the holiday season rolls around (this year, that's Nov. 16 through Jan. 6) the verdant landscaping of the Gaylord Palms is bedecked with glittering lights and inside its biosphere-like atrium about a zillion more of them blow the collective minds of the many guests and visitors who gather beneath its towering Christmas tree for nightly shows featuring the magnificent performers of Cirque Dreams. Folks looking for a "cooler" holiday vibe love attending ICE! This year, the sub-zero attraction, featuring incredible, whimsical solid-ice sculptures and ice slides will be themed on one of the most beloved holiday films of all time: "A Christmas Story!" Experience iconic scenes such as The Old Man's Major Award, Aunt Clara's pink nightmare and the ultimate triple-dog dare at the school's flagpole, all of it hand-carved from two million pounds of ice by artists imported from China's famed Harbin Festival. Also on tap in 2017: snow tubing, photo-ops with Santa and more! 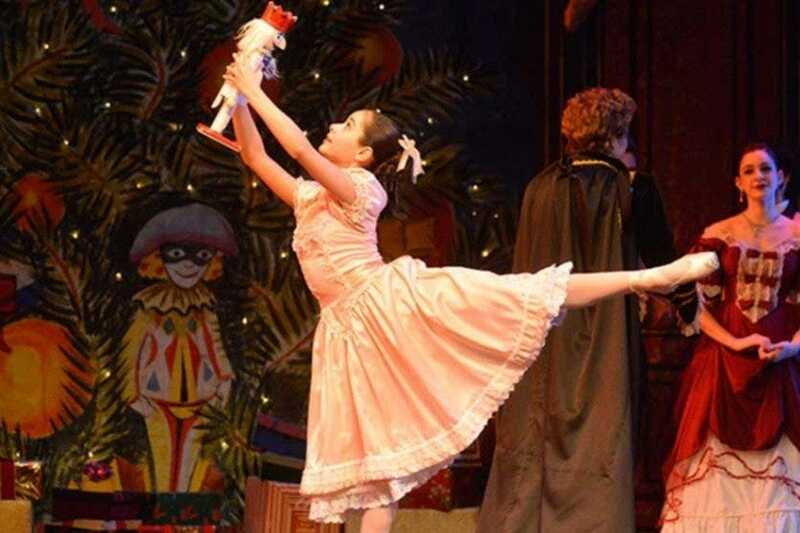 The Orlando Ballet is the city's only resident professional ballet company and The Nutcracker, of course, is a ballet that tells the story of little Clara, her nutcracker, and their holiday adventures. This year's performances run on select days from December 7-16. Tickets start at $19 and go up from there. On December 8 and 15, the Nutcracker Family Show (a one-hour version; tickets start at $15) is suitable for your entire brood. You can sweeten the deal by adding a special Nutcracker Tea event (Dec. 15 only). A delicious assortment of sweet and savory treats will be on-hand, along with fun activities and demos. 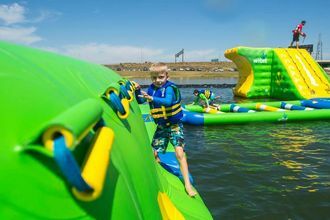 $50 for kids, $75 for adults. 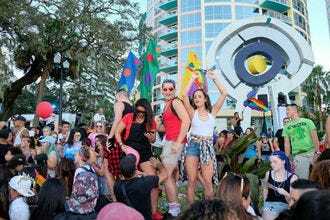 Fees benefit Orlando Ballet School. This is Florida, where sports is revered and scurvy is unheard of, the latter thanks to our state's marvelously juicy citrus industry. 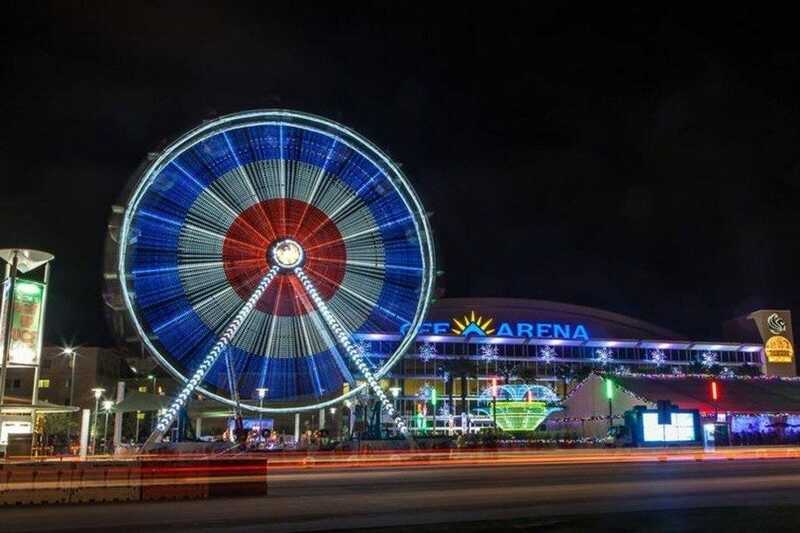 At this annual fete, traditionally held between the Camping World Bowl and Citrus Bowl games, high school marching bands from around the state (along with college bands from the participating teams) make downtown Orlando come alive with rhythm and music. 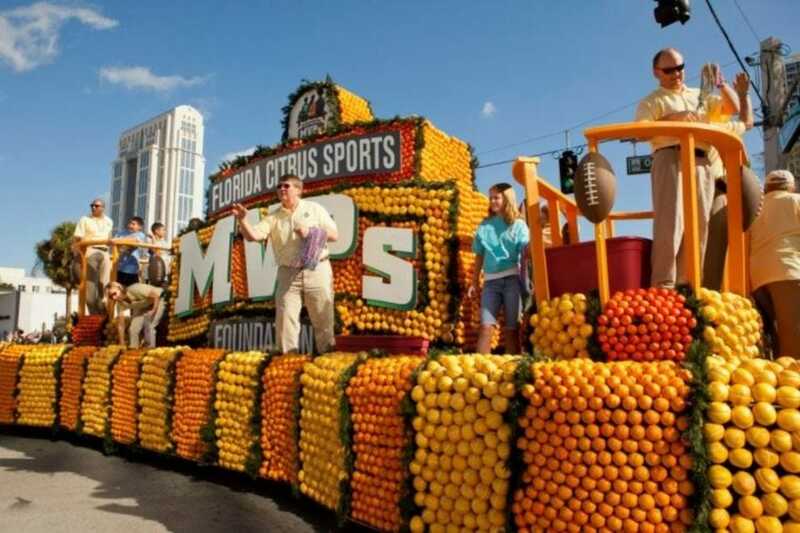 Other performers entertain the spectators and of course, signature parade floats made of all kinds of citrus fruit are a delight for a variety of senses. Curbside seating for the event is free and available from 6 am forward on parade day. Reserve seating ($30-40) is available via the Florida Citrus Sports website. This year's parade will take place on December 29, 2018. Is this the ocean or the forest? Well, neither, really, but between the park's oceanic residents and the 115 sparkling pines that make up the Sea of Trees, this holiday experience is a little bit of both. All the usual fun â" rides, aquarium exhibits, animals and more â" is on tap, along with special seasonal programming that includes Shamu's Christmas, where holiday music and killer whales meet, Clyde & Seamore's Countdown to Christmas comical sea lion and otter show, Winter Wonderland on Ice - a skating spectacular. And that's just the tip of the iceberg. Speaking of which, your family can meet Santa himself as you ride to the top of the world to meet an Arctic resident most beloved! Enjoy pics with St. Nick and animal encounters, as well. Fifty thousand gallons of wine come out of Lakeridge each year - it's Florida's largest - and locals visit and revisit all the time. Not just when friends and family come to town, but because the winery hosts an abundance of family-friendly festivals and free live music events all year long with food, crafts, even fun photo-ops. That said, even if you don't happen to make it during one of their larger shindigs (in December, that's the Wine & Chocolate festival! ), Lakeridge runs free tours and tastings all day long, every day of the week, every 20 minutes or so. You'll start off with a short film about the vineyard's history, then move on for a stellar view of the vines and wrap it up in the tasting room. The whole thing takes about 45 minutes. And of course, you can your favorite by the bottle - or the case - before you head out. Most people are well aware of the land Disney uses for its massive theme park and resort operations, but did you know that years ago, Disney set aside 11,000+ of Central Florida wilderness to ensure its preservation? Its core was once a working cattle ranch, totaling 8,500 acres, that had been slated for development in the '90s. 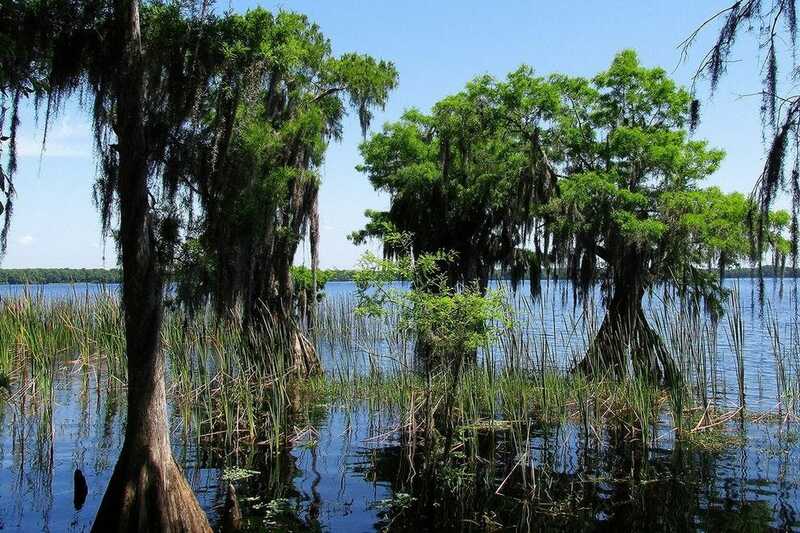 As the property sits at the northernmost part of the Everglades watershed, this would have been catastrophic, so the company stepped in, saved the land and helped restore it, acquiring several thousand additional acres of wilderness not long after. Non-native plants were eliminated and the area has become a model for conservation. The property is home to more than a thousand species of flora and fauna and a 2.5-mile trail allows visitors to explore, learn, and experience natural Central Florida, making for a lovely, serene break from the frenetic pace and scenery at the parks. Special note: Trails here are open but limited due to high water in some places due to Hurricane Irma. Call for more information. If ever you've been curious about hitting up this quarterly event in beautiful and historic downtown DeLand, December's the time. Why? Holiday shopping - and an excuse to spend a little more on unique, one-of-a-kind finds from vendors that include artists and boutiques, vintage shops and purveyors of all kinds of goodies from foodstuffs to health and body products and beyond. What else do they have going on? 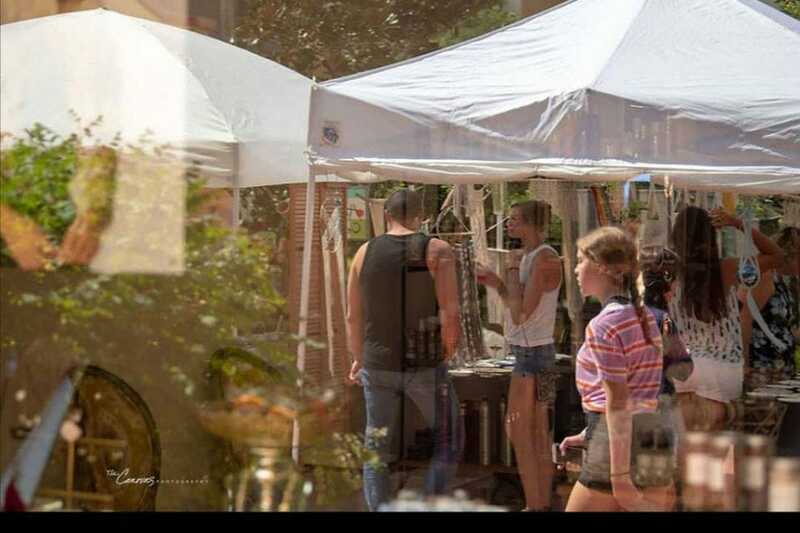 Try great food, live music and a setting that can't be beat. Feel free to peruse the quaint downtown, as well, or pop into Persimmon Hollow Brewing for a cold pint of Florida craft brew. Support small business with a quick road trip just beyond the metro.